The Walk has received a high level of community support along the way. In Bega there was a fundraising concert for the local (South East Forest Rescue) Bermagui Koala blockade, as well as a public forum on forests and carbon. It was very clear that native forests, especially Old Growth forests, are worth far more alive as carbon sinks and water filters than dead, where most of their carbon is released back into the atmosphere through the waste and burning associated with woodchipping. The woodchipping industry works against community objectives to reduce impacts on global warming. 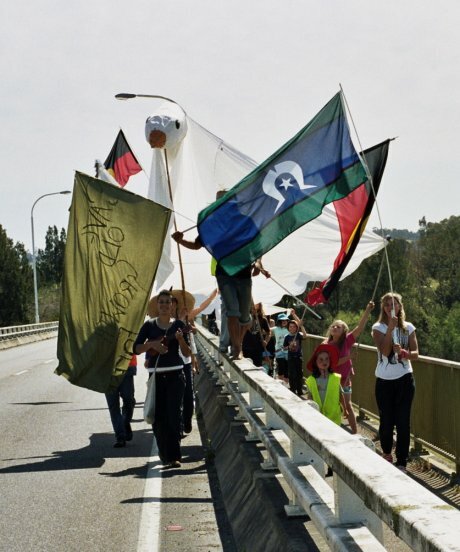 Since leaving the Aboriginal Tent Embassy in Canberra on September the first, Keri and Clover have been joined on various legs of the journey by an array of supporters. In Eden the walkers conducted a vigil and log truck count at the South East Fibre Exports (SEFE) chipmill, where enormous piles of native forest woodchips, still largely sourced from East Gippsland Old Growth, await shipment to Japan. Over 200 trucks were counted, strengthening the walkers' resolve to stop government 'Clearfell and Burn' policy in native forests. If SEFE's biomass plant proposal were approved, woodchipping would skyrocket in this region. The walk calls for the immediate end of woodchipping native forests and for Australia to become a responsible global citizen with regards to Climate Change, water and bio-diversity. The walkers enter Melbourne on the 19th of November and anticipate a send off party before embarking for Tasmania on the 22nd.